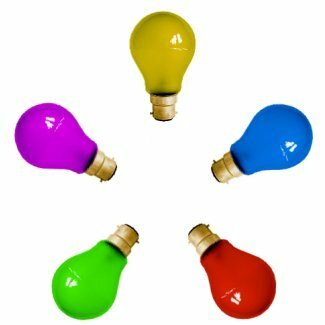 A pack of 10x Coloured GLS light bulbs with a standard BC-B22mm bayonet cap. Pack includes 2 x Red, 2 x Blue, 2 x Yellow, 2 x Green and 2 x Pink. These 18 watt light bulbs are perfect for special effect lighting and festoons, especially during the Christmas period. Lyvia code 3709ASS. 18 Watt halogen bulbs, to replace the 25 Watt incandescent version.